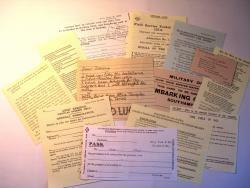 WW1 Reenactments Equipment : Great War Tommy WW1 Documents, Paperwork : Set of Pocket Documents. WW1 Reproductions and WW1 Reenactors Equipment / Kit - Set of Pocket Documents. A set of WW1 British reproduction documents/paperwork that Tommy may have filled his pockets with. THIS IS THE SAME SET AS ISSUED WITH THE AB64 PAYBOOK, for those who may not require a paybook.